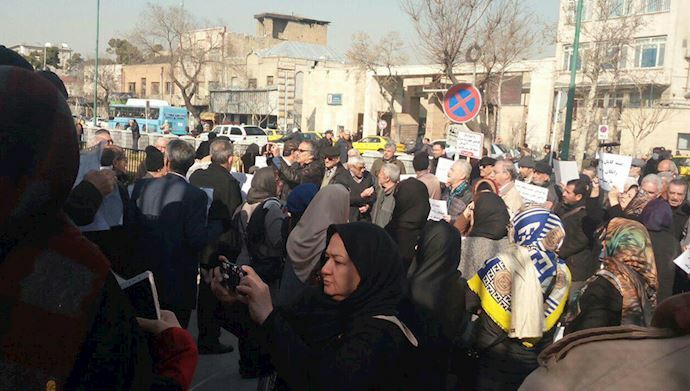 The Retirees gathered in front of the Iranian regime’s Parliament to express their outrage over the unpaid salaries. 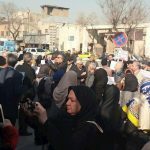 Protests resumed on Thursday in several cities in Iran as citizens continue to express their dissatisfaction with the regime’s corruption and the escalating economic crises facing the country. Protests have been taking place regularly among Iranians from all walks of life since December of 2017, when the widespread uprising began which brought thousands of people from every province into the streets to demand regime change. The regime has been unable to respond to the people’s demands with anything other than false promises, threats, and intimidation, leaving the people more and more restless and ready for change. The MEK and its resistance units have played a key role in organizing and leading the protests and demonstrations and in spreading word of protest activity on social media. Municipal workers in Marivan, Kurdistan Province gathered in front of the city’s municipality building for their fourth consecutive day of protests. The workers are protesting nine months of unpaid wages. The Marivan Municipal workers have staged several protests over the past year in response to their unpaid wages. During this latest round of protests, the workers have laid out empty tablecloths in front of the mayor’s office to symbolize the fact that the lack of pay means that workers are unable to feed their families. Despite authorities dispatching a large number of security units, locals are turning the burial ceremony for activists killed yesterday into an anti-regime rally. The state-run Tasnim News Agency reported that some of the workers have worked for as long as 21 months without pay. Local officials have still not responded to the workers’ demands or done anything to remedy the situation. Farmers in the provinces of Lordegan, Chaharmahal and Bakhtiari protested against the unfair distribution of chemical fertilizer. In Khoram Abed, Lorestan Province, farmers gathered in front of the governorate to protest the seizure of agricultural land along the Khoram Abad-Kouhdasht road by the Industry and Agriculture Complex. A group of unemployed young people in Abadan, Khuzestan Province held a demonstration on Amiri Street to protest against rapidly escalating prices and the high unemployment rate in Iran. A group of street vendors in Abadan demonstrated in Khomeini Street. The dislocated vendors demanded that they be allowed to return to the locations where they previously sold their merchandise. The municipality in Abadan has recently prohibited these vendors from selling their products, claiming that they were reorganizing the street. The street vendors brought their children to the protests on Thursday to show that the municipality’s actions were affecting families. The MEK and the Iranian Resistance support the people of Iran in their protests against the corrupt regime. The problems of unpaid wages, high unemployment, government corruption, and widespread poverty will continue until the ruling regime is overthrown and replaced with a democratic alternative. The MEK and the National Council of Resistance of Iran (NCRI) offer a viable alternative that can end the mullahs’ reign of terror.